I want to offer you the opportunity to help me make a difference in other people’s lives—people with Alzheimer’s and their loved ones. On September 19th I’m walking to END Alzheimer’s with the Alzheimer’s Association here in Ocala. I’m part of my sister-in-loves team Community Companion Care and her staff who care for many clients with Alzheimer’s. Our goal is to raise one thousand dollars for research towards a cure for this disease. Until you’ve seen the face of this disease in the eyes of a loved one it’s difficult to understand the grief and loss—how quickly lives and resources of families and care givers become completely overwhelmed. 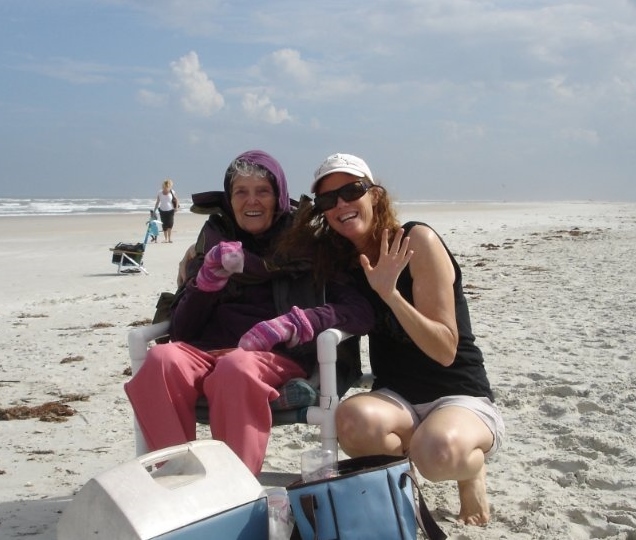 My mom died of dementia after a year of living in our home—it was literally the ‘worst of times and the best of times’ watching my mom lose who she was; who we were together; who we were becoming. My mom was fiercely independent and her becoming as vulnerable as a child was a struggle for both of us. Caregiving was the most demanding and rewarding job I’ve ever done and offered the gift of practicing unconditional love. In mom’s moments of clarity: tucking her in at night with my old teddy bear (night times are hard for Alzheimer patients) I didn’t usually receive a response to my; I love you, Mom. But one night received, Oh honey, I love you more every day. And another mentally clear day when I told her I wanted to write a book for other mothers and daughters and would she help me. She was so excited and animated! I asked her what she wanted me to tell them and she responded instantly; tell them it may not seem like we’re in here, but we are. We’re still here. They need to know that. Oh, Mom I’ll be sure to tell them that. Like I said, ‘the best of times and the worst of times’. That book is in the works and I plan to donate proceeds to the Alzheimer’s Association. Until then I will walk in memory of my mom—let me tell you she would have been at the head of the crowd leading the pack! 13 Sep	This entry was written by Laura and published on September 13, 2015 at 2:08 pm. It’s filed under Commitment, Family, Habit/s, Health, Laura, Lifeology, Love, Self Care. Bookmark the permalink. Follow any comments here with the RSS feed for this post.